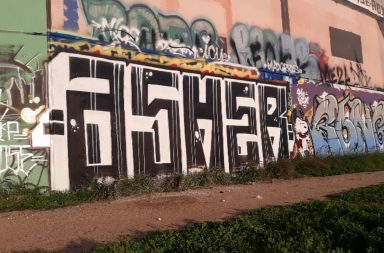 At Bombing Science, we wanted to get a sense of what was going on with graffiti this summer and what better way to do that than to explore where people were using the #graffiti hashtag around the world. The world is popping full of colours and artists are making their mark in an expanding list of cities. 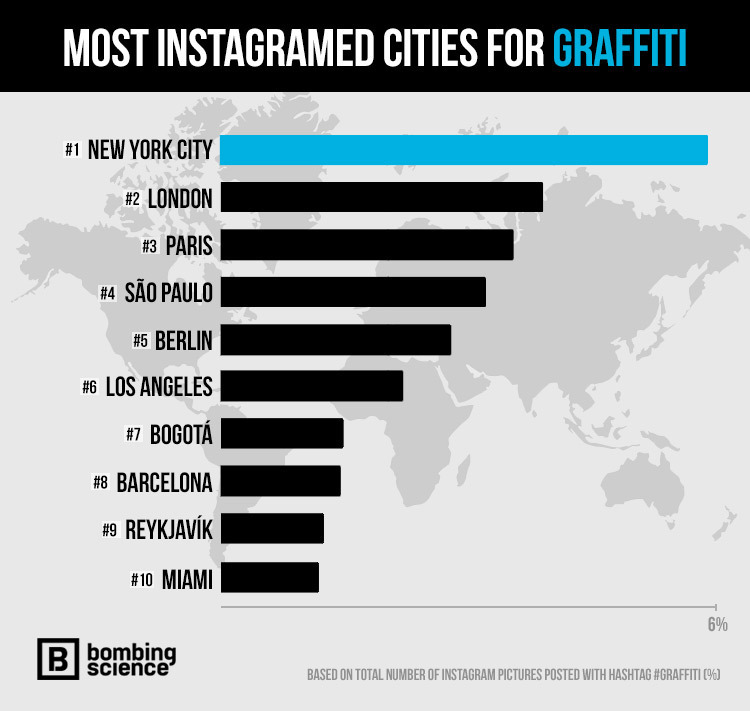 Rather than pick cities at random, we pulled Instagram data over the summer to deliver to you the Top 99 instagrammable cities for graffiti as brought to you by instagrammers from around the world. It truly is a global experience not to be missed! After talking about it with the team, we decided that we would try and share an observation or two from the big list. Break it down a bit so people could see some of the trends in terms of their own countries or cities. While you see the top 10 chart above, we’ve commented on the top 25 cities across North America, Europe and South America (including Mexico). The 25 cities chose are reflected in the top 99 cities chart below. In North America, we grouped US cities and Canadian cities together. There weren’t any surprises with New York City talking the top spot on the list in 2017. Followed up by Los Angeles (6), Miami (10), San Francisco (14th), Chicago (21) and sneaking into the last spot in the top 25 was Austin. In Canada, Toronto took the top spot and found itself 12th overall on the list. Followed up by Montreal (13) and no other Canadian cities in the top 25. Reviewing the European cities showed us that Europe dominated the Top 25 this summer. England, Germany, Italy and Spain all had 2 cities. London took the top spot and 2nd overall on the list. Paris (3), Berlin (5), Barcelona (8), Reykjavik (9), Dusseldorf (11), Moscow (15), Madrid (16), Lisbon (17), Rome (18), Milan (19) and rounding out the European cities was Amsterdam (22). Reviewing the South American Cities revealed that San Paulo (4) had top honours and was part of the top 10 cities. Next was Bogotá (7) and Rio de Janeiro (20) with Mexico City coming in (23) and Buenos Aires (24th) rounding out the list. And now… the big list! 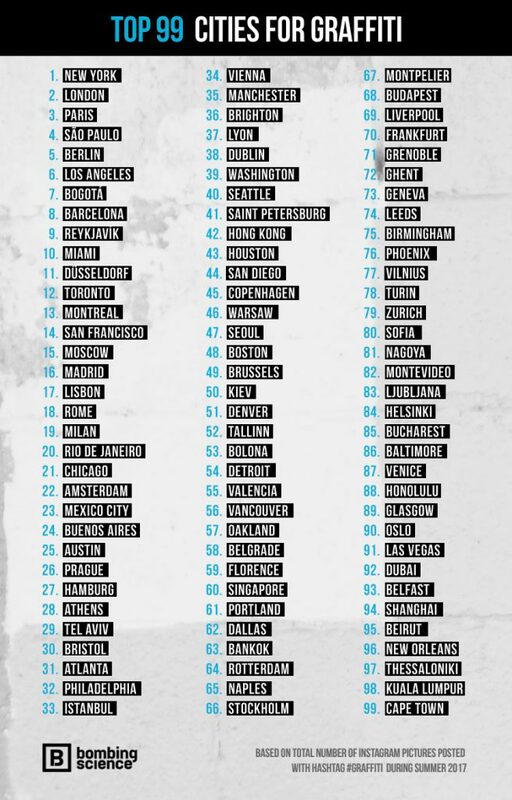 Can you find your city on the list? In cities around the world there are examples as to the positive impact of art and how it can be a positive influence on the wellbeing of the people that live in urban areas. What does that really mean? In exactly which ways does art have a positive influence on the wellbeing of cities? Graffiti as an emerging mainstream art form is helping to improve or revitalization depressed areas of cities that otherwise were considered dead zones, people are now traveling to cities they may not have considered traveling to in order to check out art destinations. Artists are finding new venues and outlets to express themselves and earn a living off of their work. 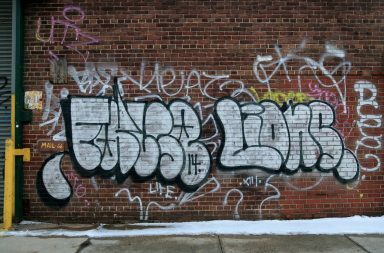 – Gregory Snyder, author of Graffiti Lives on the NYC graffiti scene. Looking closer to home, this type of placemaking is having an impact across the United States and Canada. The National Endowment for the Arts has tracked some of the results through their Exploring Our Town program. What emerges out of their research is that it’s not just the big cities that are turning a corner on their use of public space. Several of those project that had a street art/graffiti element were in small and mid-size cities including projects such as Downtown Pathways in El Paso, Texas, Grant Street Global Voice in Buffalo, Revitalizating Station North in Baltimore and The Whittier Neighbourhood Mural Project in Sioux Falls, South Dakota. Each one of these project had a set of anticipated impacts and each reported positive unexpected impacts. Notably these projects brought communities together, increased foot traffic and investments ranging from new restaurants, new retail and new infrastructure spending. In Canada, there are examples of partnerships that are forming around grafitti art including Toronto’s Graffiti Alley. It has support across non-profits including the laneways project, the city of Toronto’s Heritage Department and most recently was a featured project in the creation of the world’s longest instagram photo created by Toronto photographer Justin Poulsen in collaboration with Havas Worldwide Canada. Tunnel du Rouen is a one of the largest legal walls in Montreal. It’s a dynamic entry to the list in that the artists continually evolve the work that is done both on the wall of the tunnel and nearby. In Vancouver, a by product of their mural festival, there are ongoing activities and walking tours put on in collaboration with the the Mount Pleasant Business Improvement Area with support from local city councillors. Some other cities are starting to recreate and bring back a graffiti culture that had existed in the mid-2000s such as what happened in London, Ontario. This summer – Over 20 local graffiti artists participated in a “graffiti wall jam” put on by Mitch Taylor, the owner of Leisure Surf and Social Club store. All of these efforts contribute to more people being involved in their communities and spending more money in their own cities to support local economies. Many European cities are taking the lead, among them is Lisbon that has an official office for managing street art that has lead to the promotion of eco-tourism and walking tours. In Lisbon, the Bairro Alto area is one of the more popular places and highlighted by Bohemian Trails plus in an article by Steven P. Harrington and Jaime Rojo aka BrooklynStreet.com. There are the free walls in the Poblenou neighbourhood in Barcelona. This is an area that was once really industrial and now and has now become revitalized and is a thriving go-to destination point in any visit to the city. Another great example is the European Cultural Capital city of Aarhus with a graffiti Facebook group of over 15,000. Others include Pigneto (Rome) and Berlin which will see the opening of the The Urban Nation Museum For Urban Contemporary Art. Let’s really just pause for a moment to consider that we now even have graffiti hotels including “The Walled Off Hotel” created by Banksy in the Palestinian West Bank city of Bethlehem, We have graffiti installations at Art Basel Miami and festivals popping up in countries that we haven’t seen before such as India. The area in Mumbai known as the Lodhi Colony was turned into India’s first public art district. The 2nd edition of St+art India will be happening between October to December 2017. All of these efforts are contributing to the rise in the percentage of art in public spaces. Adding to this, a new book on street art by Ed Bartlett and published in spring 2017 by Lonely Planet. It’s no surprise that there are some of the top livable countries in 2017 with thriving graffiti communities including Germany, Netherlands, Iceland, United States, Canada and the United Kingdom. Along with the cities that have the most posts for #grafitti, we also wanted to highlight the festivals that make it happen for a lot of these artists. More and more festivals are popping up around the world and each bring their own distinct take on graffiti or street art. In no particular order some of the top festivals in our mind include Upfest (Bristol), City Leaks (Cologne), The Crystal Ship (Ostend), Bloop (Ibiza) , Santurce es Ley (San Juan), Mural Project (Richmond, USA), Mural Festival and Under Pressure in Montréal, Mural Festival Vancouver, Art Basel Miami (off-events), Nuart festival (Stavanger), Shine festival (St-Petersburg FL) and and WonderWalls (Adelaide). They represent 1 million+ fans and 100s of graffiti artists with the top group of festivals having substantial indirect and direct financial benefits topping $5 million+ and counting. One that really stands out for us is the POW!WOW! Festival series coming out of Hawaii. Founded by Jasper Wong and the main event being held each February with the support of the Hawaii Tourism Authority. It’s gone from a simple show to offering educational opportunities with their mural art schools, gallery exhibitions, and most recently connecting with SXSW creating murals around Austin, Texas. In the future, the festival has plans to expand to cities and countries such as Taiwan, Long Beach, Israel, Singapore, Jamaica, Washington D.C., Guam, New Zealand, Germany and more. The next step in the rise of #graffiti in the mainstream is the fact that brand names are now associating themselves with the festivals which brings in revenue and exposure for the artists. While some of the festivals were able to report attendance or revenue results back for 2016, many of them are just putting measurements in place and simply haven’t the time nor the resources given the logistics of managing artists, suppliers, sponsors and audiences. A lot of these festivals have completed their 2017 editions and already planning for 2018. Our team made the decision to focus on the #graffiti hashtag and determined that Instagram would be the most appropriate social media platform given the obvious appeal to photography and visuals. Instagram as a platform now has over 700 million active users worldwide and so we took it upon ourselves to build out our own tool to collect specific data. The criteria was pretty simple – We set out to capture the hashtag info plus the geographical data during the summer of 2017. Bombing Science permits the use of the assets found on this page. All that we ask is if you use anything from our post, we ask that you link back to this page so that readers can explore other parts of the project and methodology as well.